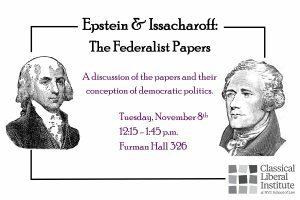 Please join Professors Richard Epstein and Samuel Issacharoff in a discussion of a selection from The Federalist Papers and their conception of democratic politics. This session will focus on articles 1, 10, 44, 51 and 78 of the Papers. There will be additional related reading that will be made available to those who RSVP. This event is open to NYU students, faculty, and fellows only.